Find your skis and snowshoes because it’s time for eco-friendly winter vacations! More and more families are choosing to spend a part of their winter holidays on vacation. It’s certainly a great way to see new places, celebrate the holidays, and spend the winter as you see fit. 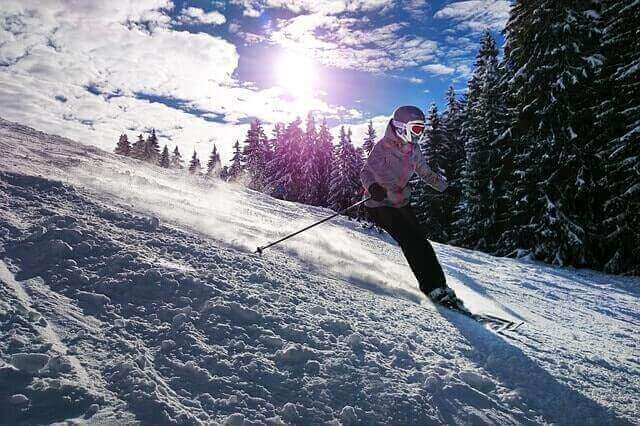 Whether that is speeding down slopes on skis, tobogganing down pristine hills (only to climb up to the top again, dragging your toboggan behind you), or simply lazing about in front of the fireside while curled up with hot cocoa and a book, what your winter vacation looks like is entirely up to you. As I mentioned in a previous post about summer vacations, tourism is hugely impacted by various things such as global warming, rising sea levels from melting glaciers, desertification, deforestation, and a plethora of things caused by human activity on this planet. We have deeply affected our planet and now we are feeling the impact of what we have done. As the largest growing industry in the world, tourism has to give back to the planet some of what we have taken from it. Besides all of this, ski resorts impact the earth negatively in an additional way. To keep the slopes covered with snow, resorts use snow-making machines. These machines are a huge drain on the environment, simply based on the amount of water and energy they consume in order to make the snow. Enter the eco-friendly winter vacation. It is possible — as you saw with the summer vacations post — to visit places that choose to minimize their impact on the planet by making the right choices regarding preservation, using natural resources to power their resorts, and even going toward plant-based options for their restaurants, often growing their own produce in organic gardens close to — or located in — their resorts. Here are five destinations that deserve your attention this winter. Located on the beautiful Mendocino Coast in California, the Stanford Inn is “a special place that enlivens and inspires”. As the only vegan resort in the United States, the Stanford Inn boasts one of North America’s most acclaimed vegan restaurants, The Ravens. Besides the wonderful food, they also have a wellness center, massage therapists, romantic rooms with wood-burning fireplaces that keep out the cold, indoor swimming pool, sauna and hot tub, and free mountain bike rentals. With their philosophy of “manifesting their commitment to live mindfully so that all might live well,” the inn is a noteworthy mention on this list. Find out more here. The Sundance Mountain Resort was founded by Robert Redford, and ever since its inception the Utah-based resort has been committed to upholding green values. They recycle and use organic products, but apart from that they help with mountain restoration and combat soil erosion through the use of erosion blankets. Their winter activities feature an alpine zip tour that is not to be missed, as well as cross country skiing, night skiing, and more. Besides all of this they also host a film series during the fall. Their Bluebird Cafe Concert series features Nashville’s renowned singers, songwriters, and musicians. They also frequently host live demos from visiting artists in their art studio. Find out more about them here. Located in beautiful Vermont, the Woodstock Inn is set in the heart of Woodstock, surrounded by the lush Green Mountains. They recycle everything, from plastic to glass to technology parts, and they convert the fryer grease from their kitchens into bio-diesel. Furthermore, they use 100% natural cleaning products across their 142-room resort. Activities include hiking, mountain biking, fly-fishing, cross-country skiing, and golf. Their restaurants serve seasonal menus that feature carefully harvested ingredients from their own gardens. Find out more about them here. The Colony Hotel is located in Kennebunkport, Maine, and is a recognizable landmark from both land and sea. With 125 guest rooms in five buildings, the Colony Hotel is Maine’s first green hotel. It is recognized as an environmental leader as they compost organic waste, use ocean water in the pools, and serve dishes made from locally sourced ingredients in their two restaurants. Activities include golf, basketball, shopping in a number of boutiques and shops in the town, bicycle rental, yoga, boating and kayaking, surfing, fishing, and sailing. They also offer eco-adventures such as walking trails, berry picking, kayak and canoe tours, and visiting fruit and animal farms, and nature preserves. Find out more about them here. Located in the middle of the Great Bear Rainforest in British Columbia, Nimmo Bay is one of the top ten fishing lodges of the world. Fishing at Nimmo Bay is catch and release in order to protect the local fish population. In addition, the resort’s waste management system cleans black and gray water before returning clean water back to the wild. Their restaurant serves local and seasonal sustainable produce. They also work with local vendors to ensure the very best quality of food. The activities offered at Nimmo Bay include helicopter adventures, heli-fishing, heli-fly-fishing, wildlife adventures, and a raincoast retreat. Find out more about them here. Where are you off to this winter? Let us know below or on Facebook and Twitter. Wherever you go, I hope you have a warm and cozy winter holiday!